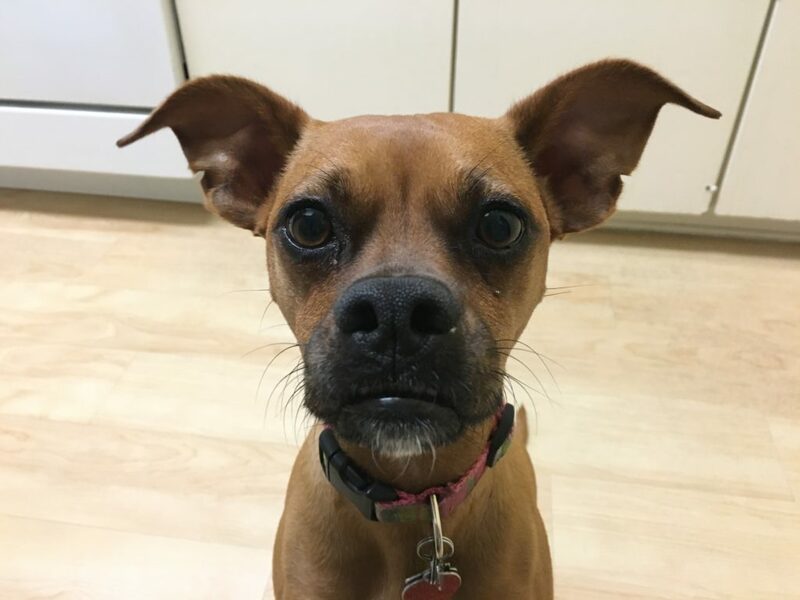 Rosie is a two-year-old Italian Greyhound Boxer mix who lives in Santa Monica, California. She is possessively aggressive or protective of her guardians when they are at home, but not so when those humans are not present. Her guardians set up a dog obedience training session to put a stop to these unwanted behaviors. I got a first-hand view of Rosie’s behavior and how she felt about meeting a stranger when I arrived for the session. Rosies guardians had hired someone to work with her before and one of that person’s suggestions where to throw treats up in the air to distract the dog. This is most likely the reason that Rosie moved away when I threw in a few high-value treats. To help Rosie feel little bit more comfortable, I took a seat on the floor. For dogs, the higher that someone sits the more rank or status they have. Because Rosie was sitting on the floor and was clearly insecure, I hoped that my lower position would help her relax. I spent a little bit of time asking the guardians about Rosie’s day-to-day routine, the behaviors they wanted help with as well as some of the rather unconventional things suggested by the dog trainer they used before. After discussing the situation and observing how Rosie was behaving, I was pretty sure that Rosie thinks she needs to protect her guardians from anyone that she doesn’t already know. This can often occur when a dog is confused about their position of authority in their living situation. Rosie’s guardians had incorporated some rules for a brief period of time, but the way that some of them were implemented likely confused the dog. I suggested that some of these rules be reapplied, but with modifications. My goal was to help the dog learn to identify as being in a follower position. When a dog identifies as being a follower, they do not feel responsible for protecting their humans. This can help reduce a lot of stress in the dog as well as help them learn to allow humans to take the leadership position. I also recommended that the guardians practice my Petting with a purpose philosophy. By asking Rosie to do something for the humans that include her assuming a more passive body mechanic, her guardians can help her start to identify as being a follower while simultaneously increasing her respect for them. This kind of positive dog training goes a long way towards helping dog want to do the right thing. We also discussed how to add a little bit of structure to meal times, on walks as well as different things the humans can do to reassure the dog without reinforcing the unwanted behaviors she was displaying. Many humans in advertently reinforce the exact behaviors that they are looking to stop by rewarding the dog at the wrong times. There was some of this going on for Rosie. Simply stopping it will help the guardians and dog move forward past some of her insecurity issues. Next I went over some new ways for the humans to disagree with Rosie whenever she’s doing something that they did not like or approve of. Because dogs probe to determine boundaries and limits, it’s important that we disagree with them the instant they cross a boundary or break a rule. The timing of our corrections is actually what helps the dog understand what it is we do not want them to do. That is why I always recommend my clients pet or correct their dog within three seconds. Because Rosie reacted so strongly when I arrived for the session, I wanted to give her guardian some tools to better control that situation. Normally I would demonstrate the technique myself, but in Rosie’s case I was pretty sure I was only going to cause her to have another outburst. I had one of the guardians step outside to play the part of an arriving guest so that I could coach the other guardian through a new door answering ritual instead. In the above video the guardian was moving a little bit hesitantly, especially when the dog attempted to go around her. As a result of these timid movements, Rosie did not respect her as she tried to take over the door answering job. This is why she continually tried to move around the guardian to get to the door. The guardian will need to increase her speed of stepping to the side to beat Rosie to the punch and stop her from challenging. Its the suddenness and confidence that causes the dog to stop or step back. Once the guardian gets more comfortable with the technique, her speed should improve which should allow her to claim the door. However if the guardian is unable to move quickly enough, I suggested they pick up a used tennis racket. This will allow the guardian to extend the reach of her arm down to Rosies level and block her from going around the guardian. After going over some tips, we reset the exercise and switched the guardian’s positions so that I could coach the other one through the exercise. I was quite impressed with how much progress Rosie made between the first and second practice. I suggested that the guardians call or text one another when they are on the way home. This will give them the opportunity to pretend that they are a guest at the door and help each other practice this new technique. Because answering the door is associated with security for the pack, a job generally reserved for the top ranking dog, taking control of this exercise will go a long ways towards helping Rosie see her humans as not being her possession. This is a necessary step in order for Rosie to stop acting so aggressively when meeting strangers with her humans. We finished things up by adding a little bit of structure to mealtime. Because dogs spend 90% of their time in the wild looking for food, adding a little bit of structure and discipline to the eating ritual is another powerful way to help Rosie identify as being a follower. By the end of the session, Rosie was completely calm. We had helped her learn to stop barking, lunging or nipping at me and instead was content to allow me to pet and touch her. But best of all, Rosie already seemed to be adapting more of a followers posture. She was looking up at her guardians for guidance and leadership and walking behind them as they moved around the room. Its a safe bet that quite a bit of Rosie’s unwanted behavior came from a position of insecurity. She thought she was in charge, but the humans didn’t see her that way which caused a lot of confusion and frustration on both sides. If her guardians can continue to enforce the new rules and boundaries with good timing, pet her with a purpose and take over door answering duties, the guardians will help her feel less responsibility and therefore less pressure and stress. Just like humans, we operate much better when we don’t feel stressed out or under pressure. If the guardians can be consistent over the next 2 to 3 weeks with the application of these new rules and exercises, they will quickly become second nature. They will also help Rosie understand that the new changes are permanent. She will likely challenge them for a few days or so, but once she understands of the humans are not backing down or changing, she will quickly adapt to her new role and follow her humans happily.